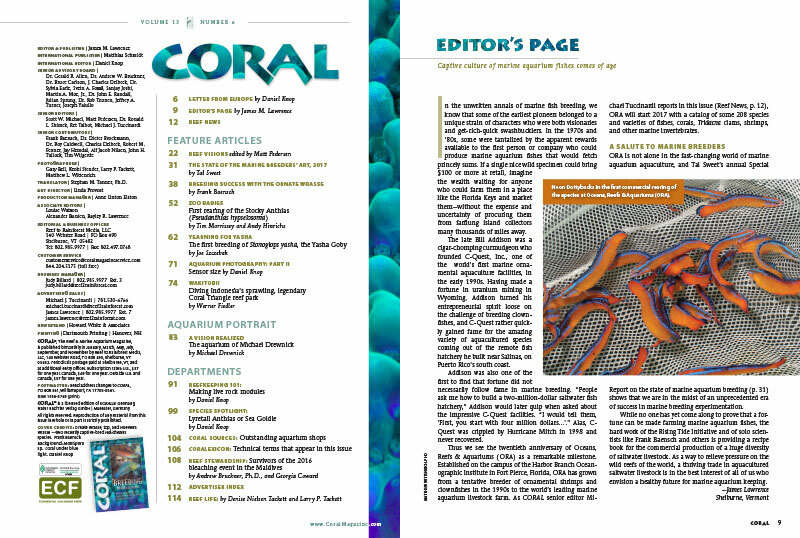 The November/December 2016 Issue of CORAL Magazine is printed and now being delivered to subscribers, local aquarium shops, and select bookstores. On sale date: November 1st, 2016, at the best marine aquarium retail stores and leading Barnes & Noble stores everywhere. 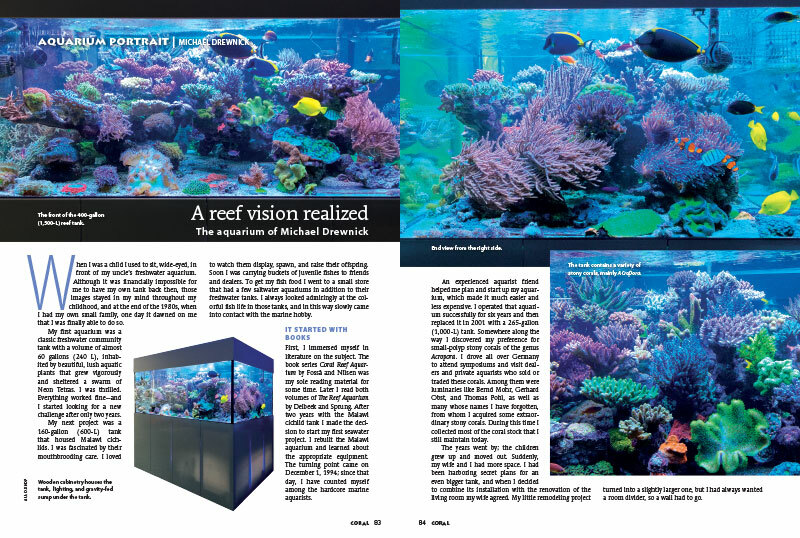 “As a way to relieve pressure on the wild reefs of the world, a thriving trade in aquacultured saltwater livestock is in the best interest of all of us who envision a healthy future for marine aquarium keeping.” – James Lawrence, on the Editor’s page. Our table of contents is also shown here. 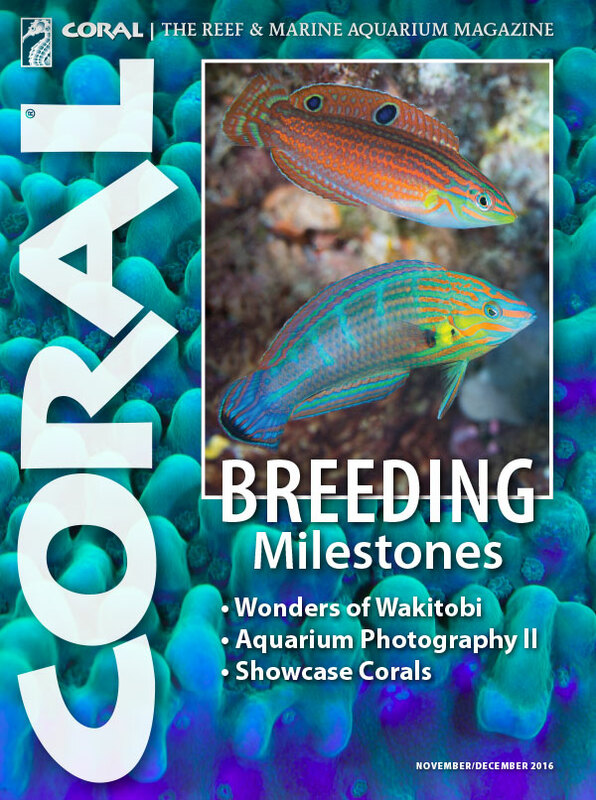 Twenty years at the forefront of marine breeding and coral farming—Michael J. Tuccinardi reaches out to ORA president Dustin Dorton to talk about the history of ORA, reflecting on two eventful decades and what lies ahead. 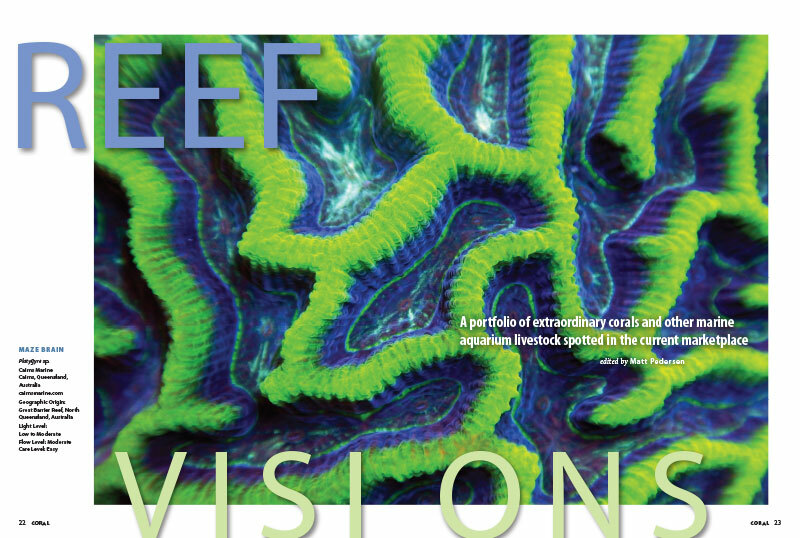 The newest Reef Visions offers a best-of-the-best selection of reef aquarium livestock choices from collectors, exporters, importers, and retailers. 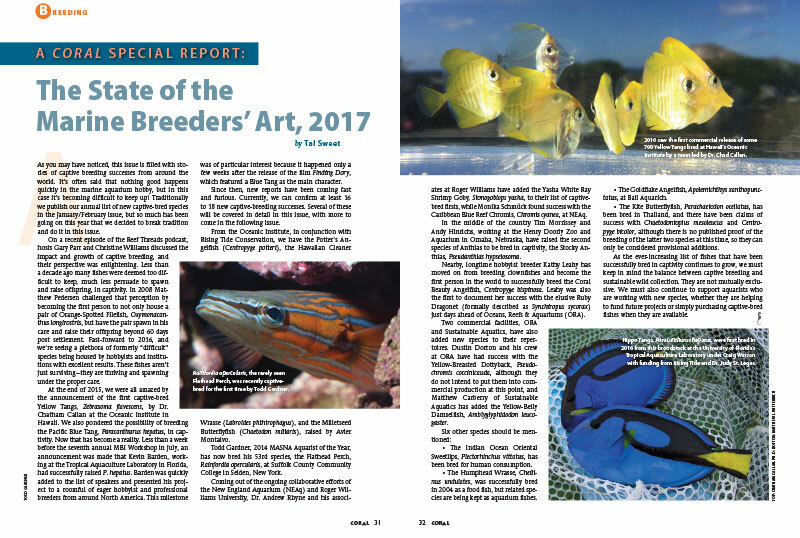 Traditionally published in the January/February issue, The State of the Marine Breeder’s Art, 2017, has been compiled by Tal Sweet one issue early. Can you name the 16 to 18 new species that were added to the list this year? No peeking! “It’s 6:00 AM and the lights just came on…” writes Frank Baensch, searching for fish larvae. 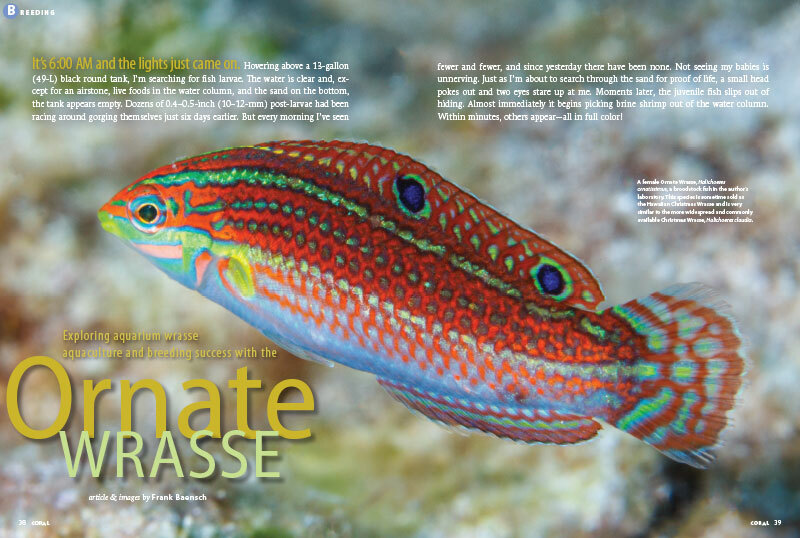 “Every morning I’ve seen fewer and fewer, and since yesterday there have been none.” How could this be a tale of breeding success with the Ornate Wrasse? 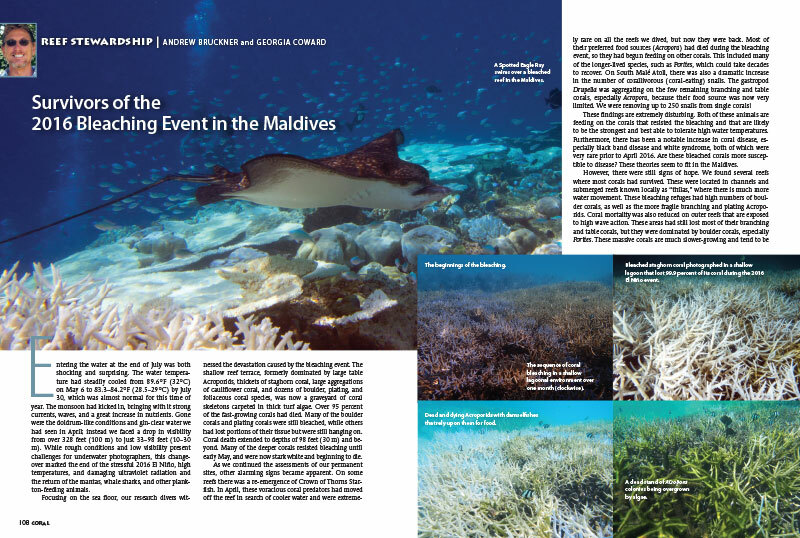 Find out in the new CORAL issue! 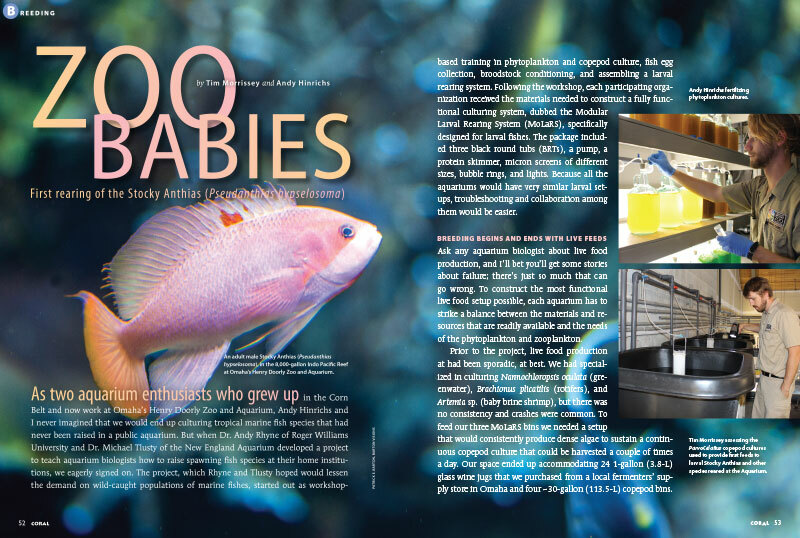 How did Tim Morrissey and Andy Hinrichs, two aquarists from the Corn Belt, wind up being responsible for only the second successful captive-breeding of an Anthias species in the world, at Omaha’s Henry Doorly Zoo and Aquarium? 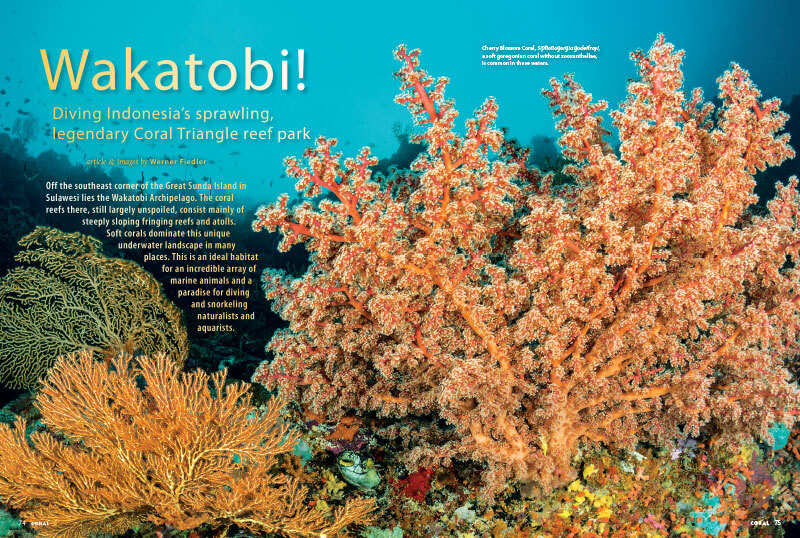 Learn everything in this exclusive CORAL Magazine tell-all! 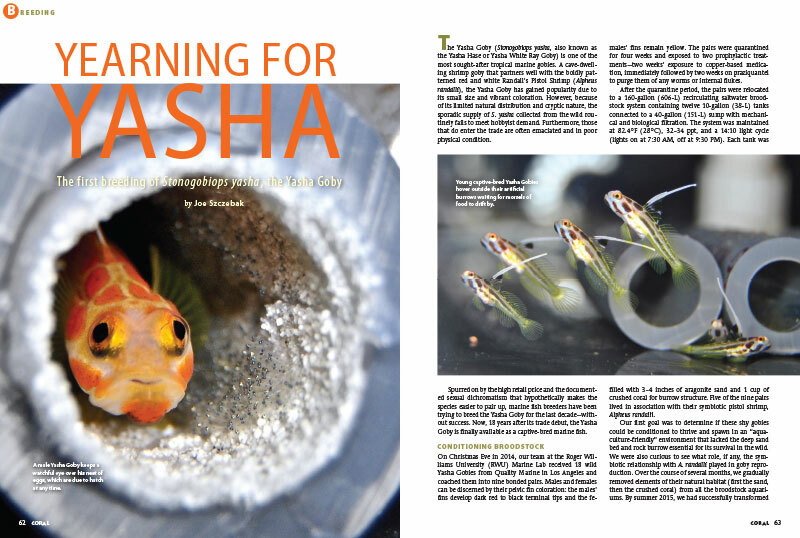 You’ve seen the news of captive-bred Yasha Gobies entering the marine aquarium trade. Now, Joe Szczebak, from the team at Roger Williams University, pulls back the green curtain and reveals the Yasha Goby’s secrets. Daniel Knop returns in Aquarium Photography: Part II. 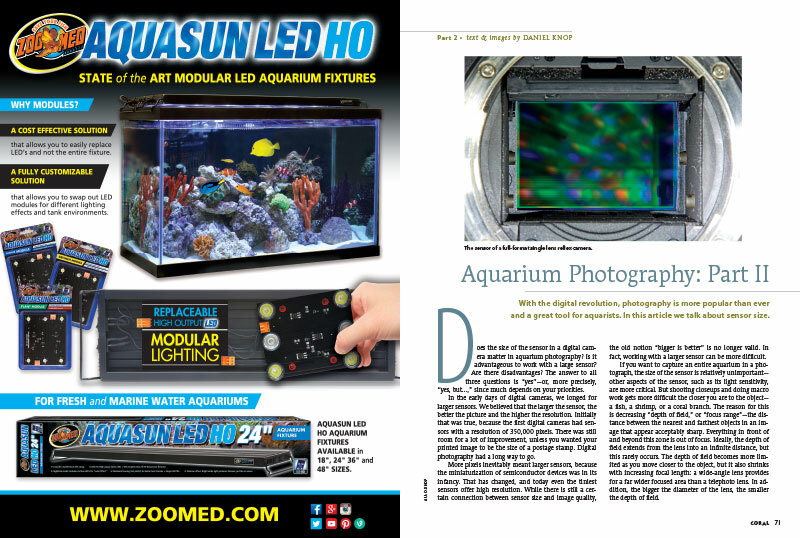 This time, Knop investigates the sensor size of a digital camera and asks, does size matter in aquarium photography? 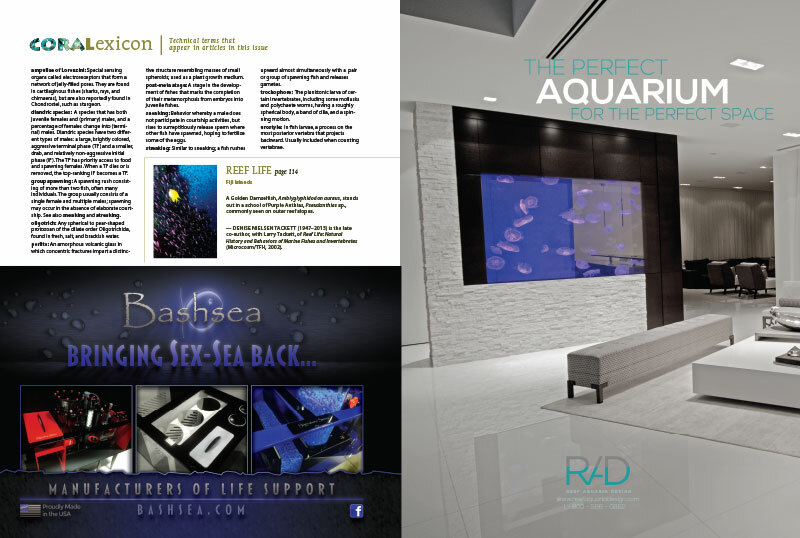 Our latest aquarium portrait features the 377-gallon reef aquarium of Michael Drewnick. 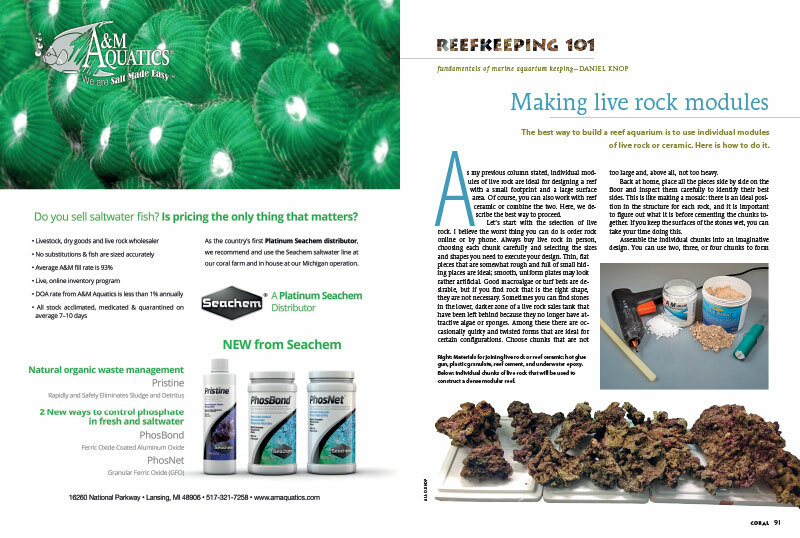 Daniel Knop continues his series of substrate and aquascaping-related topics with “Making live rock modules” in the latest Reefkeeping 101. 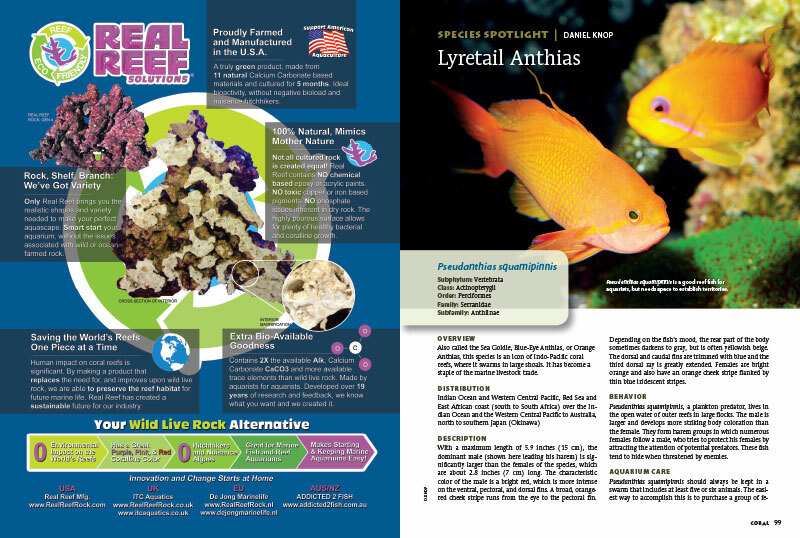 The beautifuil Lyretail Anthias, Pseudanthias squamipinnis, steals the Species Spotlight in this informative article by Daniel Knop. Looking for a single-issue copy? 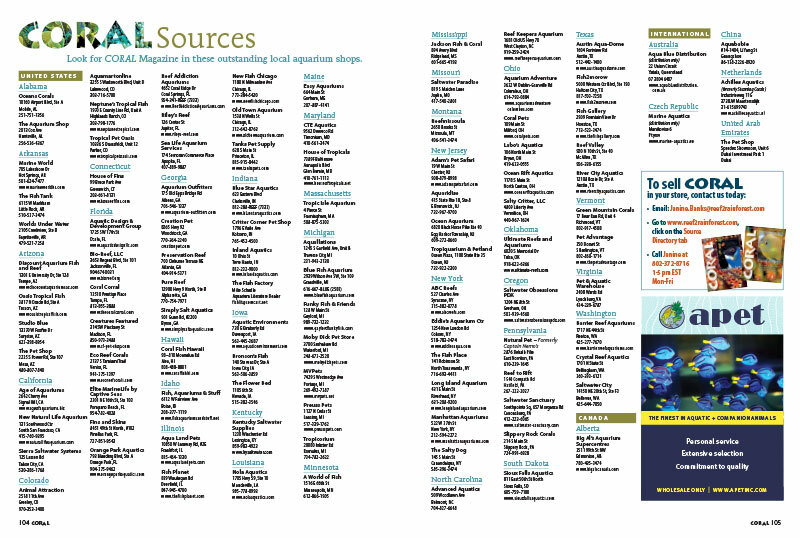 Try one of the many excellent local aquarium shops that carry CORAL Magazine. 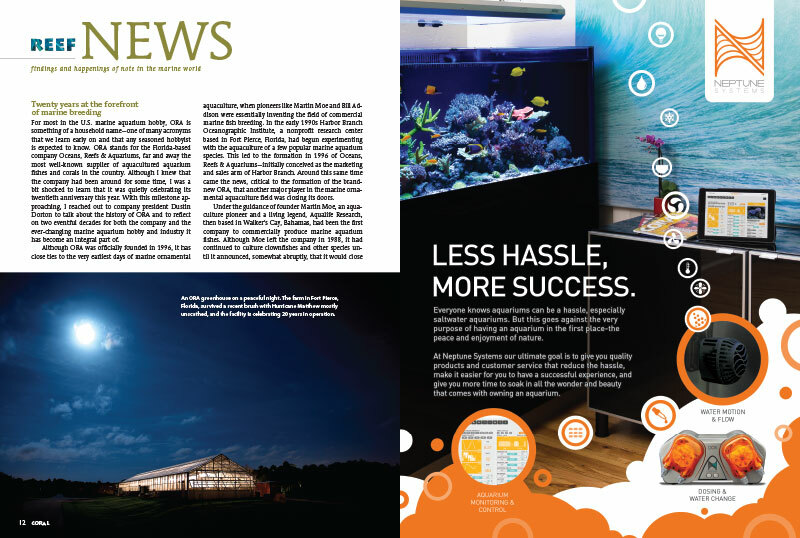 Tucked away towards the closing pages of CORAL Magazine is one of our best kept secrets: the CORALexicon. If you don’t know what the ampullae of Lorenzini are, you will after a quick read.